Once all the surfaces are smooth, the dental worker may polish your teeth. Polishing is done using a slow speed handpiece with a soft rubber cup that spins on the end. Prophylaxis (short for prophy) paste - a special gritty toothpaste-like material - is scooped up like ice cream into the cup and spun around on the teeth to make them shiny smooth. Children can swallow some of the toothpaste when brushing. 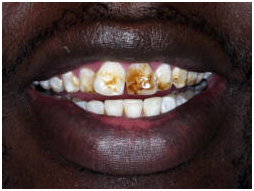 If too much fluoride is ingested during the development of the adult teeth, then the enamel may be discolored. Fluorosis usually happens during a child's first few years when the teeth are forming. 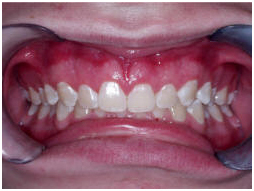 Ingestion of excess fluoride during the first seven years of the child can permanently disco lour the incisor teeth. Most cases ar, however, mild. You should teach your child to avoid swallowing toothpaste and spit out it.